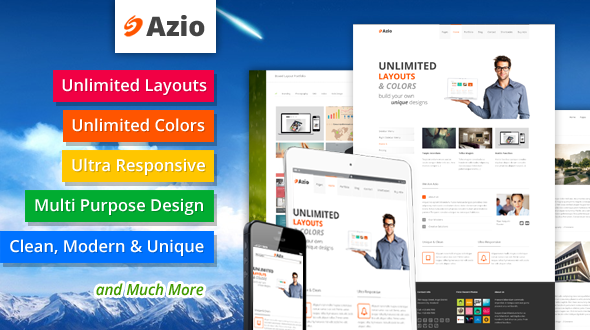 Azio is Unlimited Layouts, Unlimited Colors, Ultra Responsive, very Clean & Unique Multi Purpose WordPress Theme that is suitable for any kind of business, group or personal.
. Ultra Responsive, Azio can display very well in any devices (Desktop, Laptop, iPad, iPhone and others).
. Boxed or Wide Layout can be chosen easily for each page or post.
. Unlimited Backgrounds for Boxed Layout option.
. Over 500 Google Fonts for you to choose.
. Full Width or Sidebar Layout for FAQ Page.